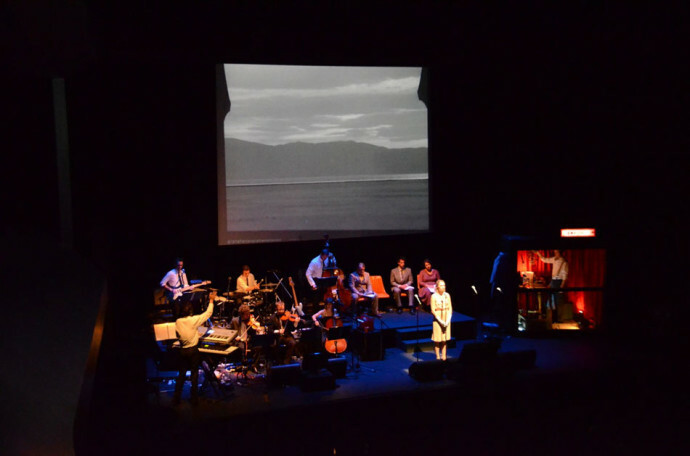 Leon Radojkovic and Jumpboard Productions present a unique combination of live theatre and classic movies. 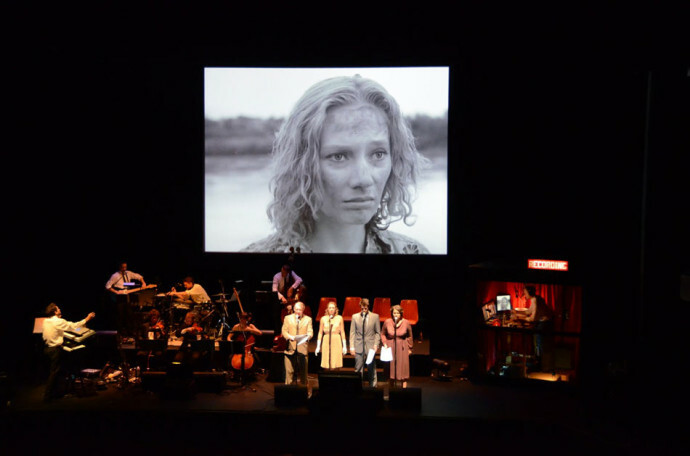 Leon Radojkovic and Jumpboard Productions’ Live Live Cinema has breathed new life into a ﬁlm from the sound era – Herk Harvey’s 1962 classic Carnival of Souls. Live Live Cinema deploys musicians, actors, and a lone courageous foley artist to create an immersive audio/visual environment. 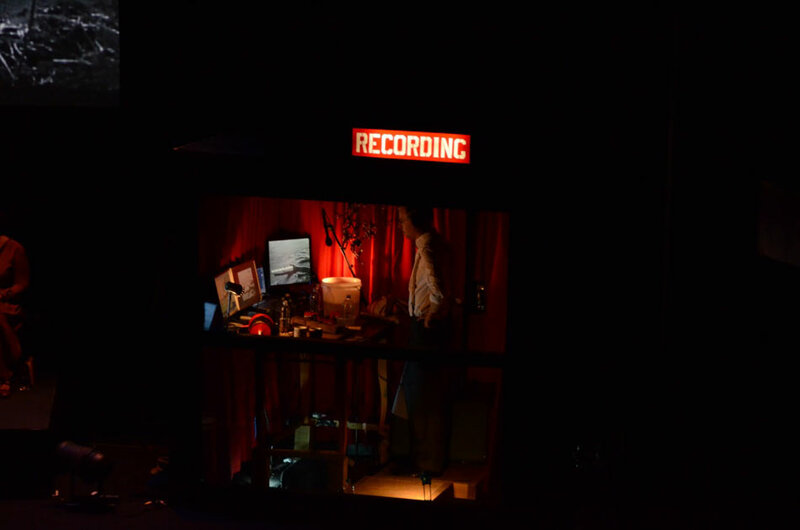 It is an integrated conversation between cinema, theatre, music and sound design, and ultimately a unique and vibrant “live live” cinematic experience. Carnival of Souls (1962), the ﬁrst and last feature by Kansas-based industrial ﬁlm-makers Herk Harvey and John Clifford, is a deeply atmospheric and beautifully shot “horror” ﬁlm, which recounts Mary Henry’s (Candance Hilligoss) descent down the rabbit-hole following her improbable survival of a car wreck. Blurring levels of reality and existence, the ﬁlm explores the dark underbelly of small-town life, and creates a world where the familiar and everyday becomes alien and threatening. 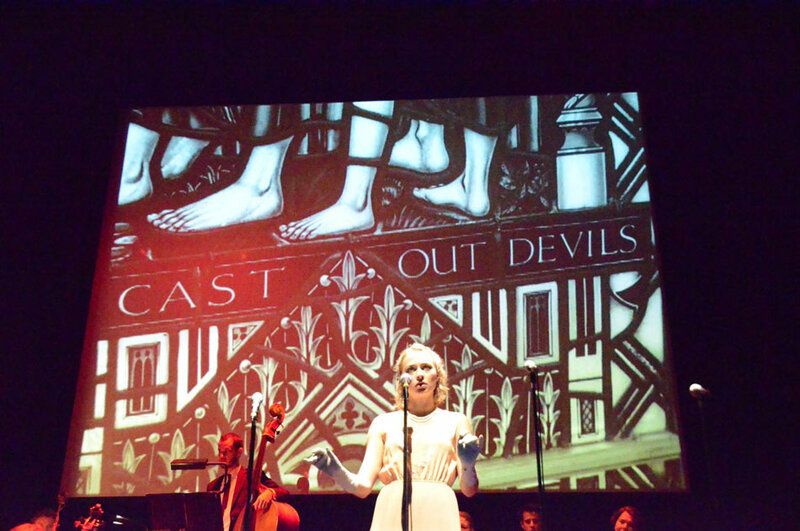 Those with an appreciation for film, theatre and music flooded through the gates of Perth Festival Gardens to witness Herk Harvey’s 1962 B-Grade horror,Carnival of Souls, brought to life with live actors, musicians and even a Foley artist (Sound effects). It was the perfect night for an outdoor performance. The cast immediately made the audience feel a part of the performance, rather than just passive viewers, sifting their way through the crowd to get to the stage. They were dressed in 60’s attire framing the era of the film. After some humorous banter amongst themselves, they settled into their positions, and it began. Carnival of Souls tells the tale of a young woman, Mary Henry (Tonight played by Underbelly Razor’s Chelsie Preston Crayford), who is the sole survivor of a car crash. She then moves to a small town in Utah to take up a job as a church organist. Life in the small town does not go smoothly as she slowly descends into madness, haunted by images of the undead. 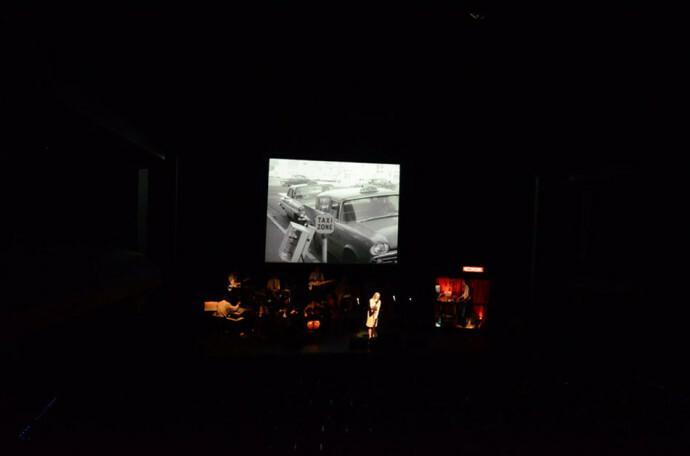 The film was projected onto a screen located behind the live actors and musicians.It was difficult to decide where to focus attention. The screen? The enthusiastic conductor? The musicians? The live performers channelling their on screen counterparts? Even the sound effects guy (*Gareth Van Niekerk*), locked away in his very own glass booth, was extremely interesting to watch. One overly enthusiastic punter in the front row eased the tension of the opening scene, letting out a bellowing laugh at the most inappropriate time possible, the car crash. Although, the relief did not last long, tension was soon effectively recreated by the score. Without a good score, a movie can fall flat, especially a horror movie. 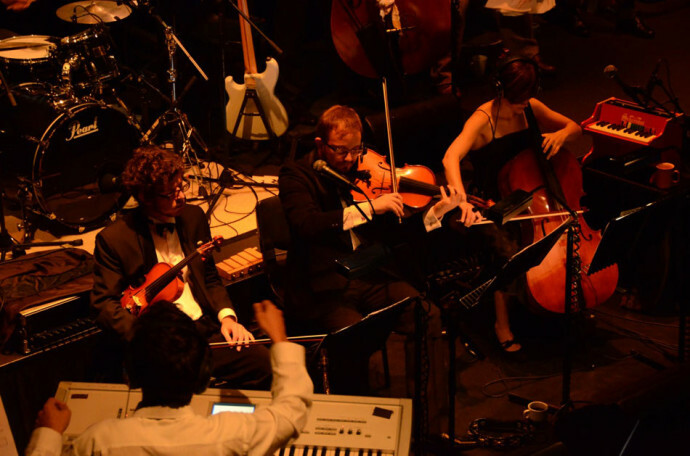 Music is an integral part of creating atmosphere and has to be used wisely to complement the imagery on the screen. Composer/ConductorLeon Radojkovic did his job exceptionally well, punctuating the scare scenes perfectly. His score was so effective that after the first scare he had the audience on edge for the remainder of the film. Even the sound of unexpected seagulls squawking was enough to scare the audience out of their seats! While the score created tension, Oliver Driver’s direction provided some comic relief to the suspenseful movie. Actors Cameron Rhodes, Charlie McDermott and Bronwyn Bradley executed their roles skilfully, poking fun at characters and emphasising stereotypes through use of humorous dialogue and goofy voices. Each played multiple characters. You would never guess who was playing who if it weren’t for the fact we could see them. The combination of Radojkovic’s score and Driver’s direction created a truly engaging experience. Much more exhilarating than sitting at home and watching the movie. Jumpboard Productions’ Carnival of Souls. Picture: Supplied. If you’ve seen the Herk Harvey black and white film, Carnival of Souls from 1962, well, the soundtrack is rather drab. So New Zealand company Jumpboard Productions, led by composer Leon Radojkovic, has rather brilliantly taken on this cult classic set to an organ score and given it some sound embellishment. Upon entering the seated outdoor auditorium in Festival Gardens on Tuesday night for the first of two performances, the scene of an old-time radio broadcast is complete with a sound-booth, four actors and a seven-piece orchestra all on stage in front of a screen, where the film is being silently projected, and the cast play out the dialogue, music and sound effects live. The film is a twisted tale about a woman called Mary who takes a job in a small Kansas town and ultimately meets her fate. As one expects from a B-grade horror flick, there’s plenty of not particularly scary moments that end up funny, but overall the film is beautifully shot with a surreal and threatening aesthetic, which gives Radojkovic plenty to play with. The soundtrack, effects and live dialogue is impeccable. At first it’s a little distracting, not unlike those first few moments of watching a foreign film with subtitles – in this instance you’re not sure whether to focus on the actors’ reading, the musicians playing or to actually watch the film – but you then settle into it and you’re soon left wanting to watch every old silent film this way. Imagine the sounds of footsteps, items dropping and doors opening all accentuated more than in the film and done with impeccable timing to correspond with the images on the screen. The actors are reading out the dialogue in sync with brilliant accents, lisps and lots of screaming; and live music comes from drums, keys, sax, strings, guitar and vocals to perfectly complement everything from bar scenes to playing organ in a church to ghoulish carnivals. These added live elements all give the film a new lease of life and Jumpboard takes the been-done-before scenario of a soundtrack accompanying a film to a whole new level. Carnival of Souls screens at the Festival Gardens tonight at 8pm and at the Albany Entertainment Centre on Friday. A large white screen before us. There’s music stands and equipment and such. There’s a booth with a clear glass panel. Before too long, the band arrives first – pouring wine or scotch into mugs – gypsies in suits ready to play a gig. They banter. Actors arrive – the usual air kisses and charisma float about the stage amongst the flash of gasping smiles. A mysterious man with a suitcase retreats into the glass paneled booth. Lead by creator/composer/keyboardist Leon Radojkovic, Carnival of Souls is an impressive and entertaining clash of genres and performance styles. Whilst remaining true to the dialogue, the music spans a range of genres and effects – at times, sweet and playful lounge music – at times distorted crashes of heavy sounds. The mix, and match and clash of music is strangely complimentary to this very quaint horror film. The film itself is an interesting experience – like that of a time capsule snapped open to reveal well worn premise of woman haunted by spectres only she can see after an accident with all the social trimmings of it’s day – the fashion, the cars, the casual sexual harassment/ gender role play and mild forms of melodramatic eye-brow arching. 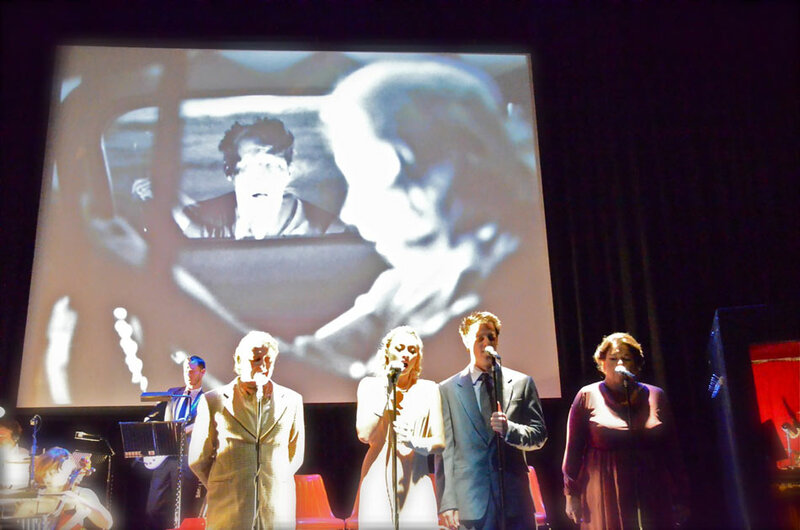 The experience is quite engrossing – as we watch performers Chelsie Preston Crayford, Cameron Rhodes, Charlie McDermott, Bronwyn Bradley glisten and chatter at the microphone- at times themselves haunted by the film or the ghost of the on-screen actor. I am a very light touch – and must admit to being suitably scared in sections – which I put down to the surprising and skilled score by Leon Radojkovic -yes. I screamed. I also laughed quite heartily – at the clumsy/quaint film techniques and the gentle predation from all the men in the film upon the mild yet maniacal church organist Mary Henry. An absolutely impressive, engaging and entertaining piece of work by Jumpboard Productions and the highlight of the Riverside Theatre’s programming contribution to the Sydney Festival. First published on19 Oct 2011. Updated on 24 Jan 2012. Chicks, man. When are they going to learn not to visit small towns alone, stay in strange guest houses alone, bathe alone? Norman and Marion made the dangers palpably clear in 1960, yet here we are in 1962 having it spelled out to us all over again, only this time, there’s zombies. It might seem like a redundant idea: take an old zombie flick (Herk Harvey’s 1962Carnival of Souls), screen it muted with a live band, live foley artist and four voice actors playing dozens of parts. Why not just watch the film? The answer, according to creator Leon Radojkovic, is that the original sounds like crap. An average soundtrack and abysmal dubbing undercut what tension there is in Hervey’s prototypical film, and Driver and team wanted to give his impressive cinematography and weird storyline a chance to shine. And so it is performed with every moment of sound recreated for us live. The performers are all dolled up in 1960s threads, which lends the event an air of nostalgia and a useful framing device. The new score, composed by Radojkovic, is a blend of vintage tunes and contemporary synth and succeeds in scaring patrons out of their seats at several crucial moments. The cast (Chelsea Preston Crayford in the lead as beleaguered heroine Mary Henry; Charlie McDermott, Bronwyn Bradley and Cameron Rhodes as everyone else) pitch their performances at the perfect meeting point of homage and invention, rarely falling into parody but always with a healthy dose of irony. The film itself is at once fascinating and incredibly average. The plotting is wafer thin (young, independent woman improbably survives car crash, moves towns, is pursued by the undead and suffers all sorts of psychological malfunctions) and almost charmingly retrograde in its morals (ladies, if you don’t want boys to touch you it’s probably because you’re secretly undead yourself!). Still, that doesn’t stop creepy faces appearing in mirrors from being terrifying, or Harvey’s bizarre sequences set at an abandoned fun fair from being strangely ahead of their time in aesthetic. In the end, Radojkovic’s score and concept, combined with Oliver Driver’s direction and the pitch-perfect accuracy of the performances tilts the balance in favour of unsettling over ridiculous. What is there to say aboutCarnival of Souls ? The pale, ghostly figure of Mary Henry (Candace Hilligoss) staggering up the muddy banks of the Kaw River is an image burned intothe public’s celluloid consciousness… Oh, wait. It isn’t. For some reason, director Herk Harvey’s only feature film is more famous forbeing ‘the best film you’ve never seen’. I’ll say no more. 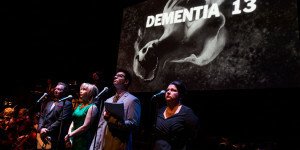 Inspired by Ambrose Bierce’s short story,An Occurrence at Owl Creek Bridge (1890), the basic plot will likely be familiar to many viewers, having likewise been adapted for any number of films since, including (but not limited to)Brazil ,Jacob’s Ladder ,Donnie DarkoCarnival of Souls might well be the pick of the lot. Filmed in three weeks on a budget of $30,000, it’s true that some of Harvey’s direction is a bit static, and John Clifford’s script can be heavy handed in places. The acting is variable. But what makesCarnival of Souls a horror classic is that, 50 years later, it’s still scary. In part this is due to its atmosphere, the starkness and stillness of the photography, together with Gene Moore’s otherworldly organ score. Partly it’s because the horror is psychological – indeed, sociological. Like George A Romero’s early films (Carnival was one of the latter’s influences when makingNight of the Living Dead ), it’s all about turning a mirror on the audience. It’s Bierce by way of Albert Camus. It also works as both a religious and an atheistic vision of what lies beyond. Either way, it’s chilling. 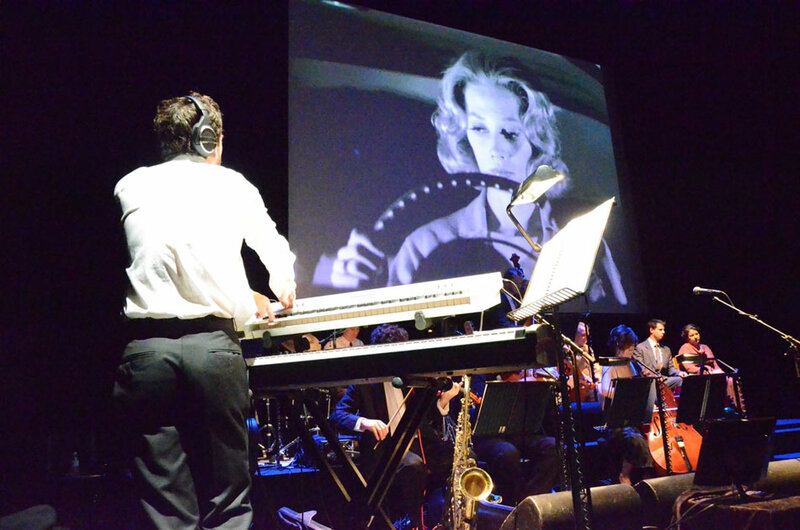 Live Live Cinema: Carnival of Souls brings the film to a whole new audience, with a new score composed and performed by Leon Radojkovic and his six-piece band. The actors’ voices are dubbed live by a quartet of very fine actors led by Chelsie Preston Crayford as Mary, with foley (sound effects) provided by Gareth Van Niekerk. All are magnificent. The score itself certainly weaves its own atmosphere, and is terrific at punctuating the scares(! ), but it can also be a bit busy at times. It’s said that the most effective horror lies in the imagination, the unlit corners of the screen, and I tend to think the same applies to music. For me, at any rate, there are moments in the film – such as when Mary explores the pavilion – that Moore’s ‘unremarkable’ organ, drifting at the edges like some faint memory, remains more appropriate and effective. Quibbles aside,Live Live Cinema: Carnival of Souls is a wonderful evening’s entertainment (‘the best live cinema experience you’ve never seen’ if you missed this current run). Hopefully, it’s the first of a series of similar productions at the Sydney Festival over the coming years. One of the problems about festivals is that some of the shows are only on for a few days and, if they are really good, they are gone by the time word of mouth and reviews have spread the news. 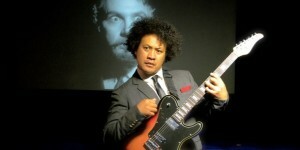 In some cases, such as Ihimaera, which only had three shows it doesn’t really matter as you will be able to buy the CD of the 12 songs that comprised the programme. In fact, getting the CD will be as good as having gone to the concert, which was spoiled by an overblown commentary that accompanied the music and songs. 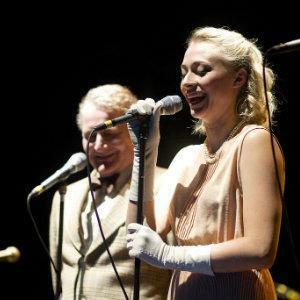 One great show which has been on twice so far at the old Mercury Theatre and will be on once more at the Civic is the quirky, weird and compelling Carnival of Souls. 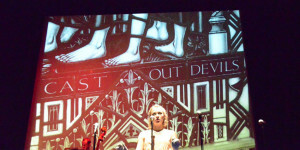 It is a remarkable piece of theatre and music that is totally engaging and entertaining. The 1962 film by Herk Harvey was an attempt at an American-style film noir, which was full of over-overacting, overzealous editing and probably an appalling dialogue and soundtrack. Composer/creator Leon Radojkovic and director Oliver Driver along with members of Dr Colossus present a live session where the film is given a new sound track of music, dialogue and a range of sound effects. Actors Cameron Rhodes, Chelsea Preston Crayford, Charlie McDermott and Bronwyn Bradley take on the various roles and manage to turn a B grade suspense movie into an A grade comedy. The film, which owes much to Hitchcock (the female lead of the film is surprisingly like Tippi Hedren, one of Hitchcock’s favourite actresses) and Fellini, provided the audience with equal measures of horror and humour. Gareth van Niekerk as the sound effects engineer in his sealed glass booth is a brilliant actor in his own right, producing just the right (and wrong) sounds to accompany the action in the film. Being a wuss, I took along a cool, unflappable companion to this 1962 B-grade horror which screens with live music, live dialogue and live sound effects. But even her nerves of steel failed, and at one point we clutched each other and screamed like teenagers. The Herk Harvey movie itself is not particularly scary, being more a surreal, suggestive take on small-town seediness (there’s a great close up of a creepy neighbour’s beady eye). Even I can watch possessed church organists and a zombie chase through beautifully shot chequered light and shade without flinching. But after an unexpected crack of live drums, we were on edge for the rest of the film. Admirably, Auckland composer Leon Radojkovic has resisted the temptation to steal the show with distracting, self-involved melodies. Instead, his new commissioned score is committed to supporting the onscreen storytelling. He uses horror convention as a springboard – high-tension violin phrases and eerie fairground oom-pa-pa – and jumps to droning double bass, loud electric guitar, and cello solos of epic sadness. The enveloping result – in our case at least – was embarrassingly effective. Director Oliver Driver has created an amusing live prologue, in which the musicians drink booze out of mugs and the voice actors, in 1960s period costume, establish a luvvie hierarchy by commanding “tea, darling!” from young Charlie McDermott. Once the film starts, who voices which character can surprise; Bronwyn Bradley does a more convincing, less fruity young man than Cameron Rhodes. Chelsea Preston Crayford’s lengthy, sometimes silent stay at the microphone, channelling her onscreen doppelganger, keeps the audience apprehensive. Shut away in his little booth, “lonely” Foley sound effects artist Gareth van Neikerk gives an excellent exhibition of a past craft, coinciding his own footsteps, key jiggling and branch waving with those on screen. We saw this at the Mercury Theatre, and its shabby chic and small size were perfect. The Civic will also have a fitting aesthetic, but get as close to the stage as you can, to watch the live performers, as well as the undead ones on screen. Exhilarating. Live Live Cinema: all audio is produced live on stage below the projected ﬁlm. Roger Corman’s original film gets the most daring, dangerous 4D Live Live treatment yet – a wild ride! 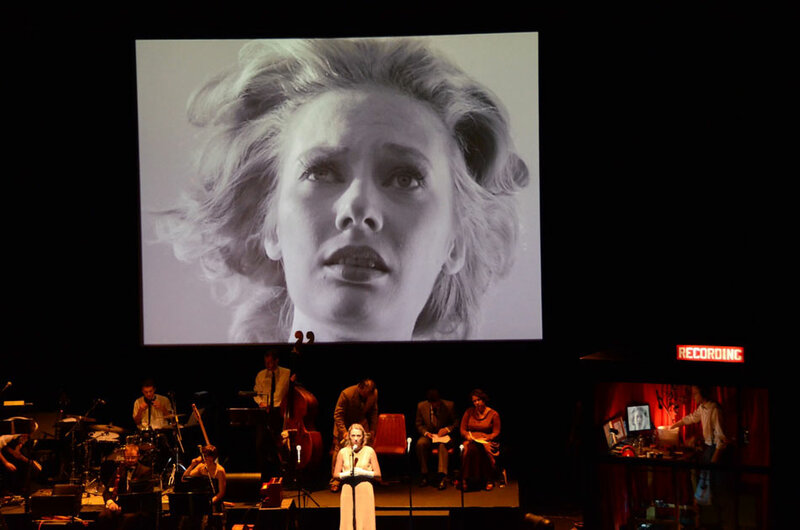 Leon Radojkovic’s Live Live Cinema and Jumpboard Productions have taken Francis Ford Coppola’s Dementia 13 to thrilling new heights. Copyright © 2019 Live Live Cinema. Powered by WordPress. Theme: Spacious by ThemeGrill.